Hi dearies…..Here’s a new section on Makeupholic World!! “Ïnformative Tuesdays”…Every Tuesday of the month, we will be discussing about some general topics related to makeup, skincare, health etc…. So, Let me begin with the first discussion topic of the day!!! Acne is a common skin condition that affects most people at some point. I causes spots to develop on the skin, usually on the face ,back, and even on the chest.The spots can range from blackheads & whiteheads which are often mild, to inflamed pus-filled pustules and cysts, which can be very severe. What if I tell you that your scariest acne scars can be easily cured with some of the food items around you!! Surprised? People try various gels and creams to cure their acne. But, that mostly results in either irritating the skin or, even stink! Spinach is my favorite green for many reasons, but mainly because it is a great food to get rid of acne pronto! 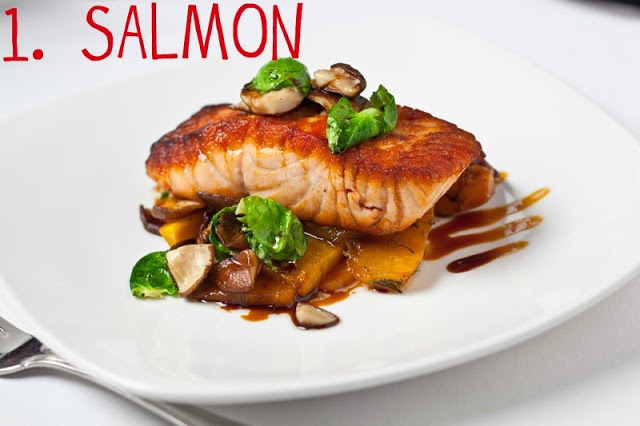 Spinach is sweet, tender, easy to add to anything, and it is also rich in Vitamin E, iron and protein. 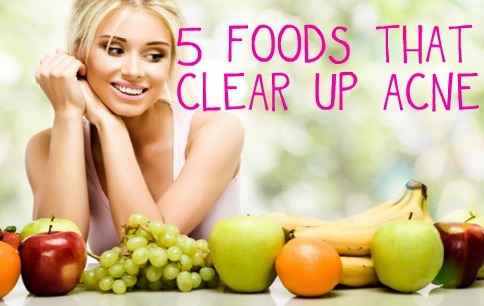 All of these nutrients help the blood flow to your skin, fight off inflammation that causes acne, and help the skin maintain healthy collagen levels, which make your skin look youthful, tight and clear. I add spinach to salads, green smoothies, and omelets most often, but use it however you like! Almonds are rich in Vitamin E, magnesium, B vitamins, and more. 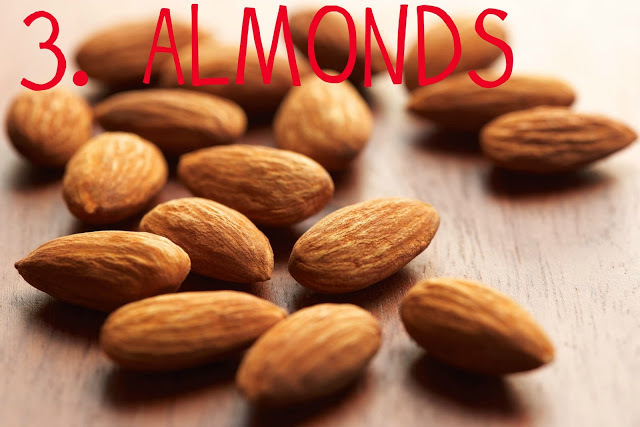 Almonds are wonderful for your skin, and they contain lots of fiber and less calories per serving than other nuts. Walnuts are another great nut for your skin, but I always choose almonds because they have so many wonderful nutrients and are easy to digest. Almond milk is also a great source of these nutrients if you choose unsweetened varieties. Cucumbers are so wonderful for your skin, but especially for getting rid of acne. Most people think cucumbers are just a watery diet food found in boring restaurant salads, but these gems are so much more! The skin of cucumbers holds the secret to their acne fighting power. Their skins are rich in silica, which is a beauty mineral that prevents acne, treats breakouts, keeps skin youthful, and maintains healthy collagen levels in the skin. Choose organic cucumbers so you can avoid the unhealthy pesticides in conventional cucumbers for the healthiest option. 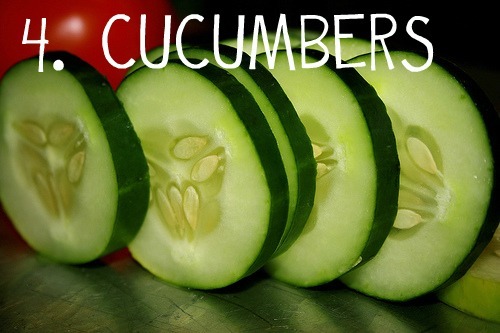 The water in cucumbers also hydrates your skin, and keeps away dryness that can lead to breakouts. If you’re vegan and don’t want to eat fish, then be sure to eat lots of chickpeas, also known as garbanzo beans. Chickpeas are rich in zinc, which fights off infections that lead to illness and to acne. Chickpeas are also high in iron, B vitamins, protein and they are low in fat. They are also high in fiber, which stabilizes your blood sugar levels. When your blood sugar is out of balance, you may not only crave unhealthy foods, but your stress hormones also become elevated, which leads to breakouts. Add chickpeas to salads, stir-fry, or buy low sodium hummus, which is made of chickpeas.